*GUEST SUBMISSION* Letter 9: What are you wearing?? What are you wearing? Oversized anything is not what’s best for your frame. ‘Phat’ pants are not cool. They were never cool. They will never be cool. They don’t make you look good. In fact, they make you look exactly like your mother told you, a “garbage lady”. Those extra-large hooded sweatshirts don’t hide your extremely thin frame, but only make you look even skinnier. I’m going to go all the way here and say from the back (and side) you look like a boy. A smelly, garbage boy. Showers or not, your pants are smelly. Remember those snowy winters wearing those 36″+ pants? Do you remember the salt stains, the frozen denim to the knees, the smell? Oh the smell… It was as though you trapped two poor rabbits in each pant leg during a winter’s walk and they perished a horrible, phat pant death. Remember Halloween when that kid asked you who you were dressed as, and you weren’t in costume? Your shaved head, suspenders and ripped chord pants were the giveaway. Why would you want to look like a raver anyway? Are you trying to look different from everyone else? Well, you don’t. There is a whole group of you that all look exactly the same. Including the smelly garbage people who do drugs. And no, it’s not cool to associate yourself with drug addict, delinquent teenagers. By the way, pull up your pants… I can see your boxers. Candace Forsyth is a 27-year-old artist from Toronto who is currently studying at Pratt Institute in New York City. Great website and concept. The mystery lady in the middle is moi (no, I’m not ashamed!) No need to blur my face (unless it was intentional). 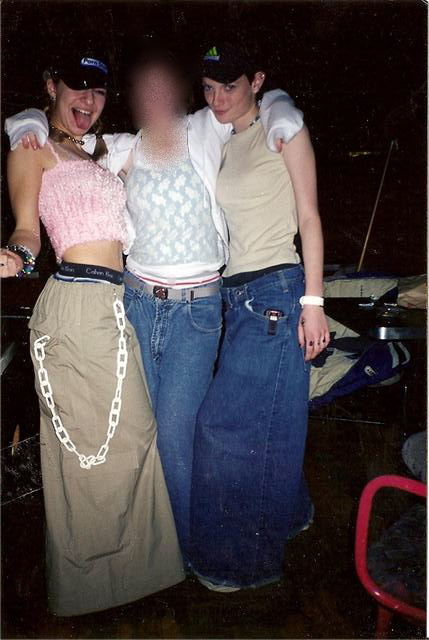 Those were the good old days – and I recall that all the clothes in that picture were borrowed that day to prep me for Warped Tour! Good old days indeed! Didn’t know whether you would want to join us on this particular walk down memory lane, phat pants and all 🙂 Glad you like the site!